Inflammatory myofibroblastic tumor is a rare benign lesion whose tumor origin is now proven. It represents 0.7% of all lung tumors. We report the case of a three-year-old child who suffered from a chronic cough with recurrent respiratory infections. Chest X-ray and computed tomography revealed the presence of a left lower lobe lung mass. 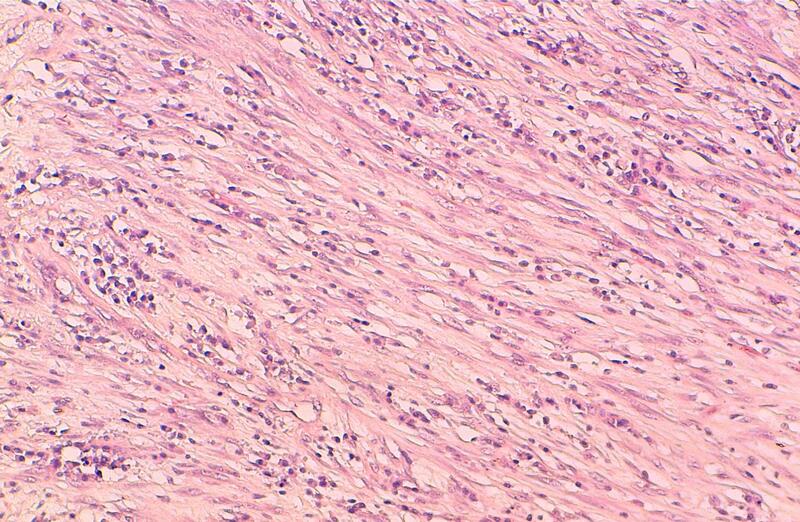 After pneumonectomy, histological examination combined with immunohistochemical study discovered an inflammatory myofibroblastic tumor. The virtual slide(s) for this article can be found here: http://www.diagnosticpathology.diagnomx.eu/vs/8722069326962972. Through this observation, the authors recall the radio-clinical, histopathological, therapeutic aspects, and outcome of this rare tumor. We report the case of a three-year-old child, who has had a chronic cough with recurrent respiratory infections since the age of 1 year. Chest X-ray showed a homogenous opacity invading the entire left hemithorax. Chest computed tomography (CT) scan showed a left lower lobe tumor with a small calcification, associated with upper lobe atelectasis. This attracted the mediastinum content to the left side (Figure 1). Bronchoscopy showed a complete obstruction of the left main bronchus. The resort to surgery was for diagnostic and therapeutic purposes, and consisted of a left pneumonectomy. On gross examination, the tumor was 8.5 cm in size, firm, whitish and homogeneous. Microscopic examination revealed a proliferation of regular spindle cells arrayed in fascicles, admixed with lymphocytes, plasma cells and eosinophils (Figures 2 and 3). 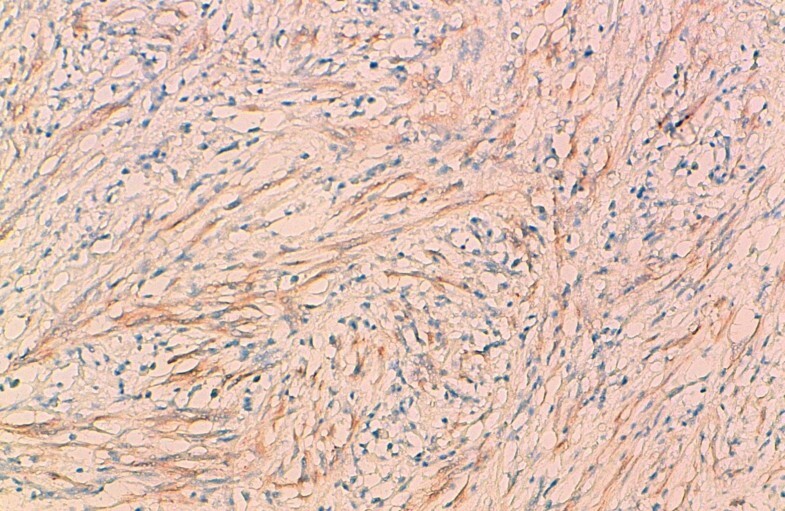 Immunohistochemical analysis showed positive staining for ALK1 (Figure 4), smooth muscle actin (Figure 5), and H-caldesmon. 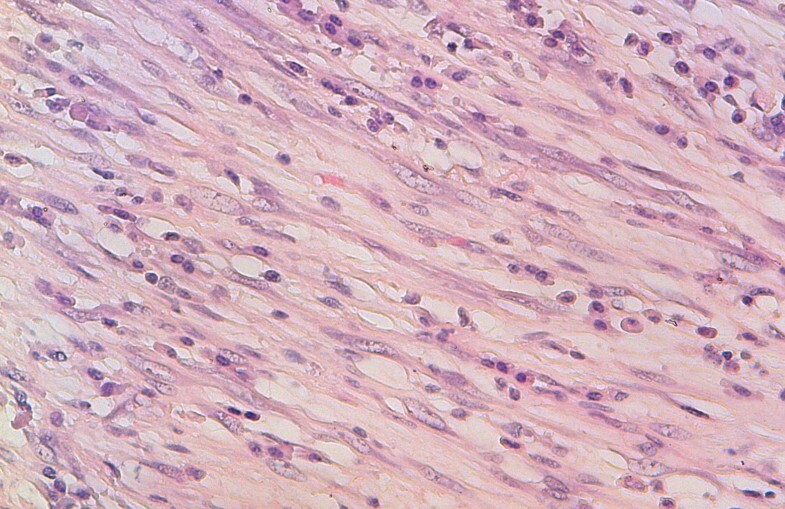 In contrast, the tumor cells were not reactive to PS100. Based on these data, the diagnosis of inflammatory myofibroblastic tumor was retained. Chest Computed tomography axial cuts with parenchymal (A) and mediastinal (B) window showing a left lower lobe tumor containing a small calcification, associated with upper lobe atelectasis. The whole is responsible for the attraction of the mediastinum content to the left side. Spindle cells arrayed in fascicles, mixed with inflammatory cells (medium magnification). Proliferation of regular myofibroblasts mixed with lymphocytes and plasma cells (high magnification). 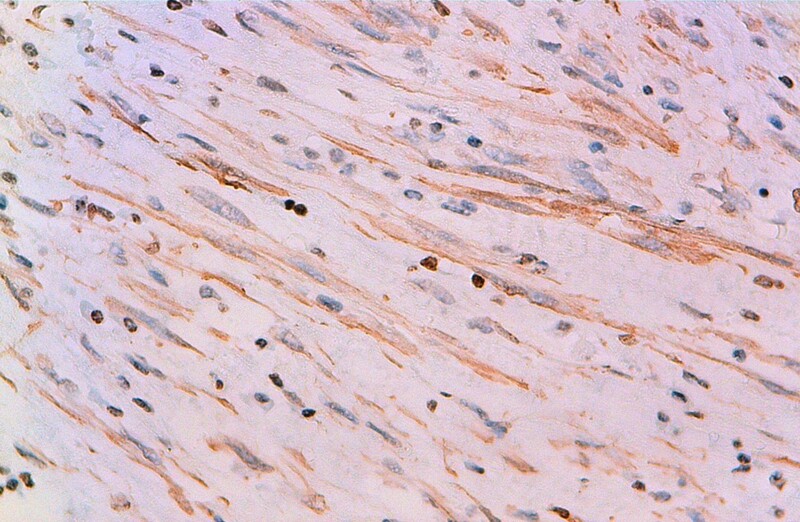 Immunohistochemical study showing reactivity for ALK1. Immunohistochemical study showing reactivity for AML. The IMT is a rare benign lesion representing 0.7% of all lung tumors. It was previously called inflammatory pseudotumor, plasma cell granuloma, histiocytoma or fibroxanthoma. [1, 2, 5, 6] It was first described in the lung in 1939 but other extrapulmonary sites were reported [2, 4, 6]. Völker and al  reported a laryngeal IMT and compared it with spindle cell carcinoma. Because of similar morphology of theses lesions, only immunohistochemical investigations allowed the correct final diagnoses. Another case was reported in the urinary bladder by Lekas and al . It was initially misinterpreted as a low-grade leiomyosarcoma of myxoid subtype. Al-Jabri  reported another case in the liver in which imaging raised the possibility of metastatic liver disease because of the similarity of appearances between the two pathological entities. Histological examination was necessary for diagnosis. Several other sites were reported including spleen, lymph nodes, esophagus, stomach, salivary glands, breast, epididymis, central nervous system, and soft tissues. [2, 4, 6] The IMT affects both sexes, at any ages, with a slight predominance in children and young adults. 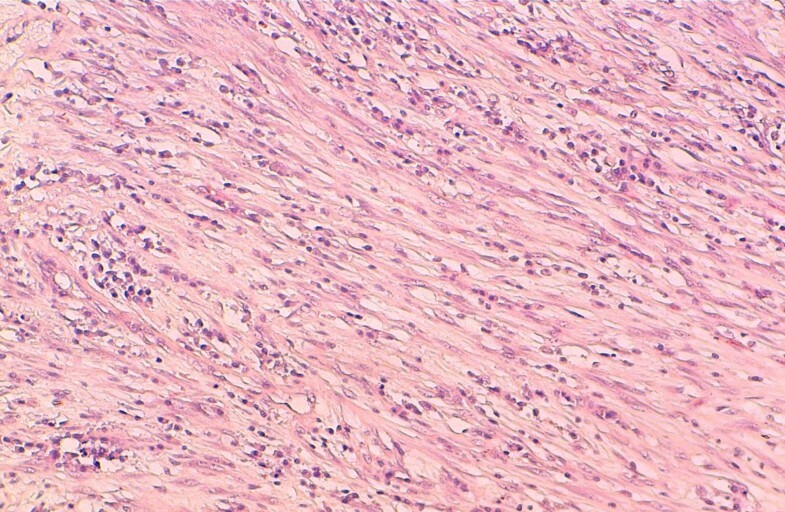 [4, 6] In our patient, the tumor was discovered at a very early age. There are many uncertainties about the pathogenesis of IMT. Several hypotheses have been proposed such as an auto-immune mechanism or infectious origin. Indeed, 30% of cases are closely related to recurrent respiratory infections which are caused by several microorganisms such as Mycoplasma, Nocardia, Actinomycetes, Epstein-Barr and human herpes virus [2, 3, 5, 6, 10]. Other studies, however, suggest that it might be a true neoplasm due to the presence, at the myofibroblastic component, of a fusion gene involving the ALK gene, a tyrosine kinase oncogen located on chromosome 2p23, initially found to be arranged in anaplasic large cell lymphomas. This fusion leads to constitutive overexpression of the ALK, causing cell proliferation. [4–6, 10, 11] In our patient, the tumor is due to overexpression of the ALK, detected by immunohistochemistry, and is probably favored by recurrent respiratory infections. Patients are afflicted with nonspecific symptoms such as cough, dyspnea, hemoptysis, chest pain, fever and fatigue. Weight loss and anorexia are rare. [2–6] However, most patients are asymptomatic and the tumor is discovered incidentally on a chest X-ray performed for another reason. [1, 4, 6] The only symptom in our patient was a chronic cough. Despite IMT is a benign tumor, it is considered by some authors as a low grade tumor because of malignant features such as local invasiveness, recurrence (4% in cases of incomplete resection) or malignant transformation (exceptional). The evolution depends on the tumor size (less than or equal to 3 cm) and the quality of surgical resection. The 5-year survival is 91.3%. [2–5]. Inflammatory myofibroblastic tumor is a rare benign tumor. Clinical and radiological presentation is variable and nonspecific and the diagnosis is rarely made before chirurgical management. Only histological and immunohistochemical study can confirm the diagnosis. Despite being a benign lesion, its potential for recurrence and local invasion requires complete surgical resection. Written informed consent was obtained from patient's parents for publication of this case report and any accompanying images. The authors thank Batoul Ech-chahdi which participated in the English translation of the manuscript. NH, LC and AA performed the histological examination of the lung and were major contributors to writing the manuscript. SB analyzed and interpreted the patient data. M R is the surgeon who operated on the patient and interpreted the patient data. MB performed the radiological examination. MH, YA, ST assisted in data interpretation and patient follow-ups. All authors read and approved the final manuscript.